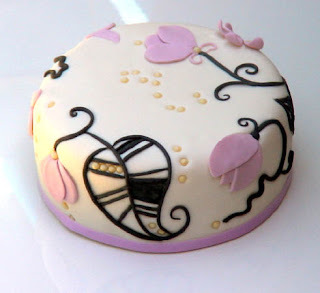 This gorgeous cake is designed to accompany the Art Nouveau Cupcakes (series 2) as a top tier cutting cake. A rich, sumptuous Dutch Chocolate Buttercake filled and coated with Chocolate Mousseline Buttercream and then covered with Vanilla Fondant. 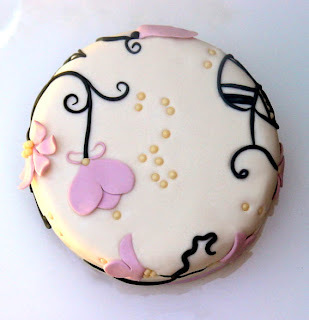 All the decorations are edible, being made from Gum Paste or sugar pearls. 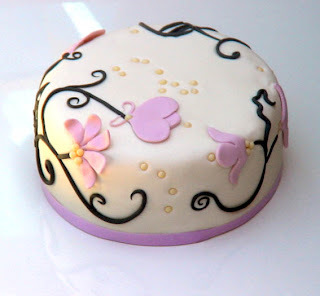 The cake stands 3 inches/7.6cm high and is 6 inches/15.2 cm in diameter. love your design!!! Greetings from Malaysia. 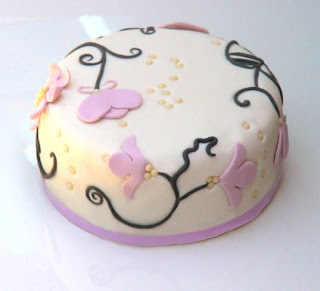 This cake design is stunning, it's so beautiful in it's simplicity!